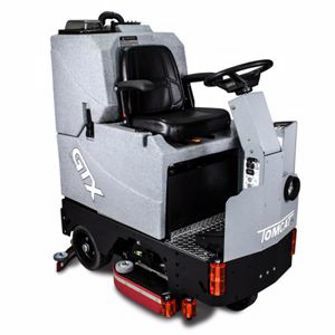 Tomcat’s GTX ride-on floor scrubber (also known as the Tomcat CRZ) can make your floor look like new again. Polish epoxy and stone floors, clean tire marks and areas with heavy foot traffic, create mirrored reflections in marble all from your comfortable, high visibility seat! Easily getting through doorways and hallways (unlike many other riding scrubbers) it would make a great addition to just about any facility – school systems, healthcare, warehouses, grocery, retail, arenas and many others. Get the productivity of a riding floor scrubber with better maneuverability than a walk-behind. The GTX is available with either the disk scrub head system that has a lower maintenance cost and 50% more scrubbing power than other brands or the cylindrical scrub head that is perfect for cleaning grout lines, rubber floors and sweeping debris while scrubbing. Scrub Pad Width: 13", 15", and 17"
Dimensions (LxWxH): 54" x 26" x 55"
Scrub Pad Width: 22", 25", 28", and 32"